The original plan was a one-shot gig – inspect SEND services in each of England’s 152 ‘local areas’ (that’s the local authority, plus the NHS commissioning groups that work within it), check to make sure the 2014 SEND reforms were being implemented effectively, and wrap the job up in 2021. Local area SEND inspections aren’t like school inspections: there’s no grade from outstanding to inadequate. 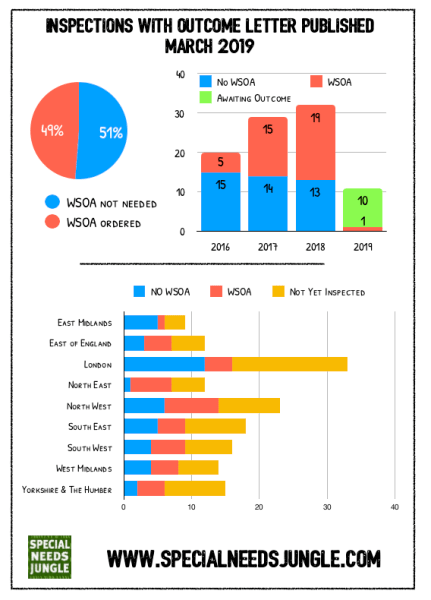 But in 40 of the 82 local areas – nearly half of them – inspectors found performance poor enough that they invoked their most serious sanction: instructing the local area to submit a written statement of action (WSOA), a plan showing how council and NHS leaders are going to improve the service. Local areas get 10 working days’ notice of the re-visit – a week longer than they got for the inspections. That’s less time for local area turd-polishing than you might think – during this time, the local area has to keep the inspection team fed with data showing what they’ve done to improve since the inspection. 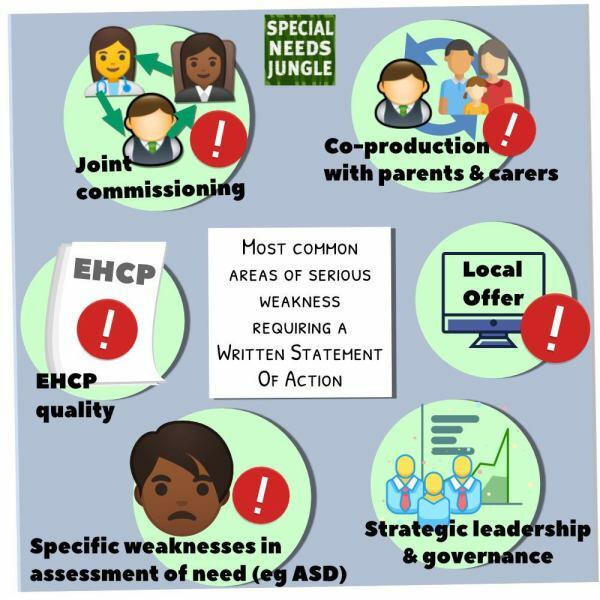 And after a frustratingly complacent and inconsistent first year, many of these inspections are now unearthing hard truth about how SEND services work at local area level. The process is now overseen by specialist inspectors who genuinely ‘get it’. But this is a problem that boils down to a simple question – will these inspections actually improve things for children and young people with SEND? 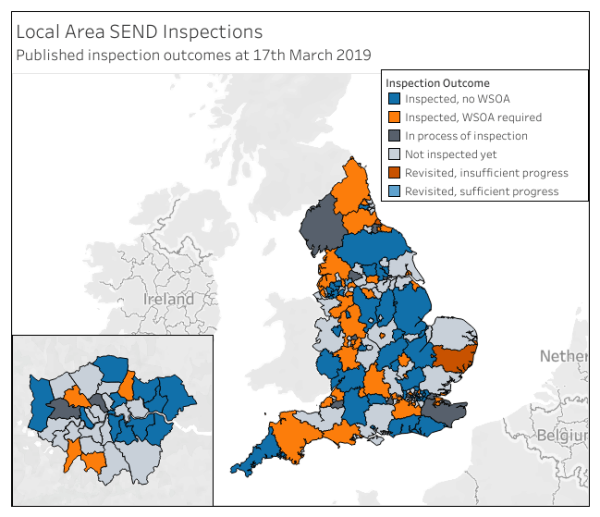 Unbelievably, four-and-a-half years after the SEND reforms began, with evidence of failure now visible from space, with serial unlawful behaviour stretching back decades, this sector still has no regulator.These inspections aren’t a fix for that. Parents are still going to need to rely on the SENDIST Tribunal, the Local Government & Social Care Ombudsman, and even judicial review to secure their children’s educational rights. 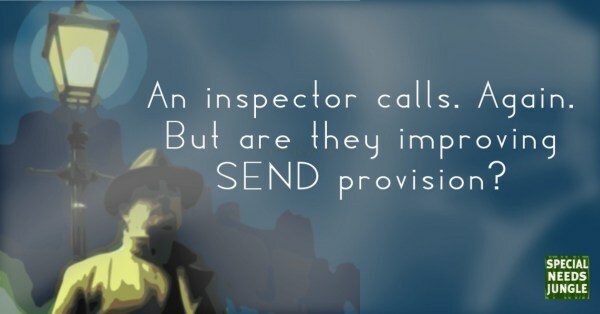 And ultimately, inspections also don’t happen frequently enough to embed changes in local area organisational behaviour – which is still shocking in many local areas lucky enough to be in the first wave of complacent inspections. Talk to families in places like Derbyshire, East Sussex, Hertfordshire, Northamptonshire & Trafford – who all ‘passed’ in 2016 and 2017 – and you’ll hear cases of appallingly unlawful behaviour. These local areas won’t be reinspected for at least two, possibly three years. No real improvement’s likely there for years. Who’s next for a re-visit?